Hand Painted Feathers - "The Zebras"
In this signature piece the Zebras are feeling spring fever as they express their love through a good grooming. This double-feather piece is only available in 10 x 20 and features hand painted mat accents. Includes artist's certificate of authenticity. 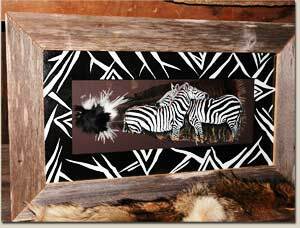 The sample at right is shown with Barn Wood Shadowbox Frame and Hand Painted mat.